The Italian Renaissance Breeches derive much of their appeal not just from their striped appearance, but also from the quality of the materials they are made from. The combination of royal velvet and satin makes these breeches quite appealing. The base color of these breeches is rendered on the incredibly soft velvet, while the satin is represented on the slashed stripes that decorate the legs of these breeches. These breeches are approximately knee-length and are loosely-fitted from thigh to knee. They are gathered at the edge by a fitted band. The Italian Renaissance Breeches are available in a wide variety of colors. 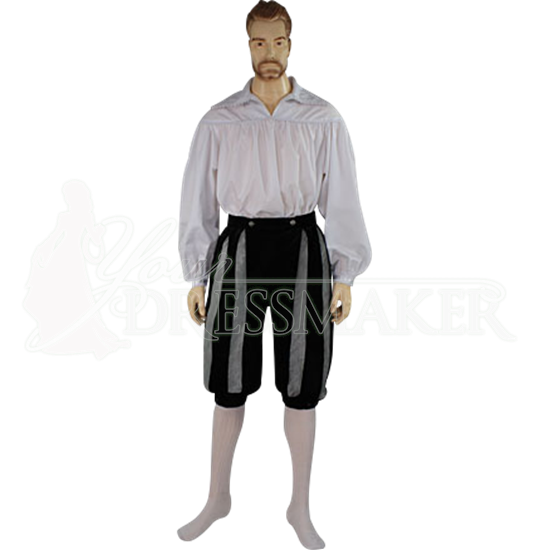 The breeches are pictured here with a renaissance-styled shirt and long socks, which are also not included with the actual breeches. Striped as they are, the Italian Renaissance Breeches match perfectly to any one of our stylish striped shirts or doublets. They can also be matched to dozens of other different looks without much trouble as well. These breeches are made from a combination of Royal Velvet and Satin fabric and can be custom made in any color combination you wish. If you don't see the color combination you would like to order in the drop down menu, please contact us to set up a custom order. Please see our Fabric page and click on Royal Velvet and Satin to see the available colors. When ordering, the first Color dropdown menu is for the main color of the pants. The Accent Color is for the slashed satin stripes.